Daily Aaj newspaper is Urdu language best news source published from Abbotabad, Peshawar, Islamabad and Karachi at a time. The Mr. Abdul Wahid Yousufi is the editor of Daily Aaj Epaper. This is national newspaper with 36 most informative pages. The online Daily Aaj Epaper is available for Abbotabad and Peshawar editions. Aaj Sunday Magazine is also published on each sunday with extra source of fun and Entertainment. Along with latest front page news the Roznama Aaj have also City, National, Districts, showbiz and sports news. The featured page of Aaj news is very attractive having some most trending news of the day. 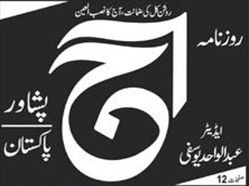 You can read online daily aaj Epaper on dailyepaper.pk.